T.N.T. Thursday - Zipper Pouch! I was so inspired by Jamie Lee during last week's T.N.T. Thursday's linky party that I decided to try making a zipper pouch last weekend. I used my Giddy scraps for the outside and some Collection for a Cause Traditions by Moda for the lining. I loved how it turned out and following this tutorial made is sooooo easy! As soon as she saw it, my daughter Marianne decided she needed it for her makeup... so as fast as it was finished and photographed, it had disappeared. See what can happen when you click on those links during linky parties? Inspiration everywhere! Now click on the button below and go check out what else people have been trying this week. I decided to include my knitting and crochet WIPs this week because I don't quilt all week and I'm enjoying knitting and crochet so much I'm starting projects like crazy, but having a really hard time finishing them! And it's so funny because I'm the same way at work. I love starting new projects, I get all excited about brainstorming ideas, getting the project plan done and then putting prototypes and storyboards together. But then when the projects starts to slow down a bit or when I hit a bump in the road, I get a little discouraged and it takes a lot for me to stay focused on the job and get the project finished. At work, I don't really have a choice, I have to finish the projects I work on. I probably wouldn't keep my job for very long if I can`t finish what I start. But with my hobbies, it's almost as though I give myself permission to "quit" on a project. I have quilt tops that have been sitting in a drawer for over a year waiting to become a finished quilt, I have BOM blocks that have been waiting for me to sew them up for months and months. And now I seem to have transferred this nasty habit onto my knitting and crochet! Not good. I hope to have all my quilting WIPs finished during 2012 and I'm now also going to keep track of my knitting/crochet WIPs as well. I completed the March Schnibbles (the top only) this weekend. You can read about it here. 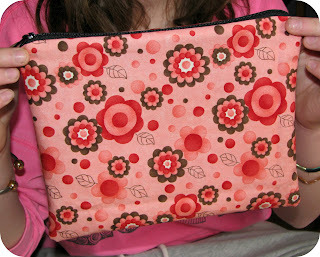 I also made my very first zipper pouch this weekend, but more on that tomorrow. I started this pillow cover weeks ago to go with the Granny Square baby blanket I made. But I ran out of yarn in those colours so need to get more. I plan on using this tutorial to complete the pillow cover. Next, is a sweater I started for myself months ago... probably more than a year ago! This is a super easy pattern I found in a book I own. 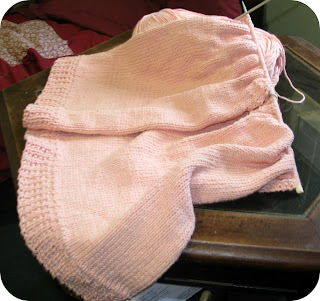 The colour is a soft pink and I'm using cotton so it should be perfect for this summer... If I can get it finished! And finally, I started working on a new granny square blanket last week. I picked some vibrant colours for this one and I'm using Sugar 'n Cream 100% cotton. So far, I'm loving it! Linking up at Freshly Pieced for WIP Wednesday! If you have a minute, go and check out what else is happening in blog land! The weather was absolutely dreadful all weekend which turned out quite good because that meant more time in the sewing room! 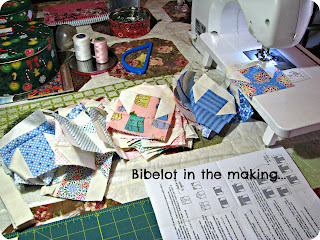 By Saturday evening, I had my Bibelot top - the March Schnibbles - all done. I decided not to make the pieced border. I think once I add a really colourful binding, it'll be very nice. I also like the size as it is right now - 35 1/2 " square. I have to say these little T blocks were a lot of fun to make. I chose to use Cape Ann charm squares with a cream background and love the look. Today is Thursday so that means linking up at Happy Quilting for T.N.T. Thursday! What have I done this week? Well, up until this afternoon, I really hadn't tried anything new, but then I was reading the blogs I follow and stephmabry over at Hope Sewing is Genetic wrote about a charm swap she is participating in. She also mentioned that the person organizing it was looking for more participants. I clicked on the link and decided to sign-up! This will be my very first swap! I'm so excited! BUT - we need more participants. If you would like to take part in a rainbow charm swap, please hop on over to Adventures in Obsessive Crafting to get more information. The beautiful weather up here in Quebec kept me outside most of the weekend (I thought it would be incredibly ungrateful of me to stay indoors while the sun was shining so bright and so warm all weekend), so I did not get as much sewing as I had planned. Basically, the only thing that got done this weekend is piecing some of the blocks for Bibelot, the March Schnibble. I decided to use 2 Cape Ann charm packs for this project. I thought the cute colours looked really nice on the cream background. When I left the cottage on Sunday to get back to the city, I had a cute pile of "T" blocks all finished. I'm linking up to Freshly Pieced for W.I.P. Wednesday. Some shopping, winning and ... playing outside! Once in a while, the Fat Quarter Shop has one of its fantastic and totally fabulous Facebook Specials. If you aren't a Facebook Fan of the FQS, I strongly suggest you become one. So a couple of weeks ago, the FQS announces a 40% Facebook Special on the Amelia collection by Me and My Sister Designs. Last week was a pretty good week all around! Also, Spring came early this year in Quebec! Getting 20 degree (Celcius) weather in mid-March is unheard of in my neck of the woods. But that's what it was like yesterday. I took advantage of the beautiful sunshine to clean the garden and discovered my daffodils are out! 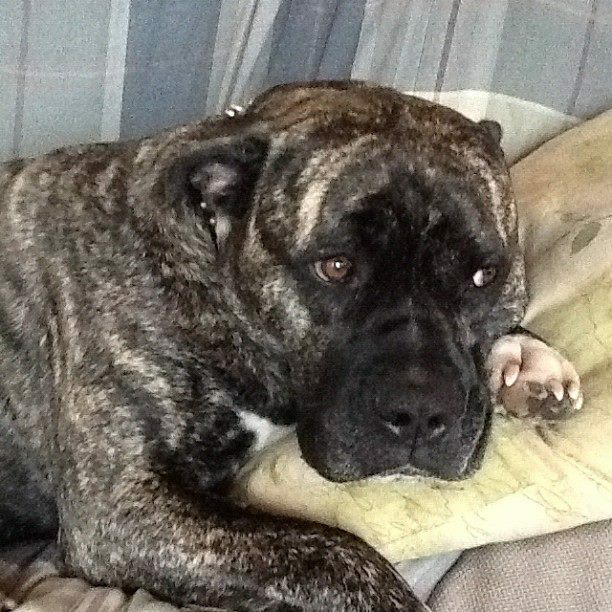 Bronx really enjoyed the nice weather too! Yesterday, I posted my finish of Kaleidoscope. What I didn't mention in yesterday's post was that I tried something new when I quilted this one... Free motion quilting in the ditch! Up until now, whenever I wanted to stitch in the ditch, I would put on my walking foot and do each line vertically and then each line horizontally. For Kaleidoscope, I really wanted to stitch in the ditch around each square and using the walking foot would have taken forever and wrestling with the quilt while I try to turn it 90 degrees was not an option. So I thought - why not try free motion quilting! Well - let me tell you - this free motion quilting in the ditch is a lot harder than it looks! But I persevered and after a couple of hours, I was done. Here is a picture of the back where you can see the lines. It's definitely not perfect, but I think it's pretty good for a first attempt. Oh and I also quilted a cute motif of a moon and star in each centre block. I'm quite happy with the results. I'm linking up at Happy Quilting for T.N.T. Thursday. What have you tried this week? WIP Wednesday and my 100th Post! Over the weekend, I finished Kaleidoscope. I'm still not crazy about this one... not sure why - maybe it's the lack of contrast. Anyhow, it's finished and I was really happy to cross that one off the list of tops that needed quilting. I also finished quilting block 2 of Two Percent. Only 7 more to go! At the pace I'm going with this one, I might be done with this one in the Fall! I received the March Schnibbles pattern this week - Bibelot. I really like this one - I think this design has the ability to really make the fabric pop so I have to choose the charm packs I use carefully. Linking up at Freshly Pieced for W.I.P. Wednesday. I won the Liebster Award! Pat from Color Me Quilty awarded me a Liebster Award. Thank you so much Pat - this is super exciting! Link back to the blogger who presented you with the award. Present the Liebster Award to 5 blogs that have less than 200 followers that you think deserve to be recognized. 2. Islandlife Quilts - Michele was one of my very first follower and a very talented quilter. She is super helpful and never hesitates to share tips and tricks, especially when trying something new. 3. Quilting, Losing and Tea - Karen is a wonderful blog friend and has a great little blog. 4. 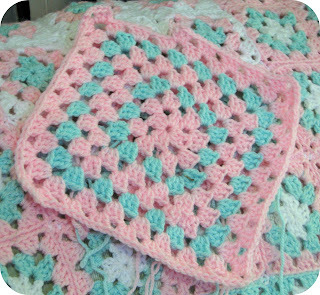 Sami's Quilts and Crafts - I recently discovered Samantha's little blog and I love it! Samantha's projects are fun and just beautiful. 5. The Patriotic Quilter - I "met" Joanne through the Another Year of Schnibbles quilt along and she's got a great little blog. I've been wanting to make myself a tote bag forever... But I had never made a bag before and a lot of the tutorials I found in blogland just seemed too complicated for me so I kept searching. Well... I'm sitting at the cottage on Saturday, sipping a coffee and just looking around when I found the PERFECT tutorial for a tote bag on FairyFace Designs. The tutorial is actually from Leanne who was guest-blogging over at FairyFace Designs. All you need is 18 charm squares and some lining fabric. So I chose Blueberry Crumb Cake by Blackbird Designs for Moda and got to work. So excited in fact that I decided to link up at Happy Quilting for T.N.T. Thursday! And what have you tried this week? I've had a pretty good week in the sewing department! I completed the Girly Square-in-a-Square top over the weekend and I'm in love with it. You can read all about that project here. I continued working on the quilting of Two Percent... This one is massive so I'm tackling one big square every weekend. Another Work In Progress for me is losing weight. I'm happy to report that I've lost 2 more lbs this week for a total loss of 18 lbs since January 1!!! I went shopping for new pants this week and I'm officially 1 pant size smaller... almost 2 (the pair I bought is a little too big, but the size smaller was a little bit too snug). I had a great weekend at the cottage. Got lots of sewing done and managed to exercise! I took the dog for a couple of long walks... he just loves walks in the country - all kinds of different scents, lots to look at and many, many small animals to chase! Bronx relaxing after a nice long walk. If you have a Jelly Roll lying around, you can either use a whole Jelly Roll and match the strips in pairs of 1 light and 1 dark or use just a half of a Jelly Roll (20 strips) and cut 20 more strips from a neutral solid. From each strip, cut 4 - 6 1/2 " rectangles and 6 - 2 1/2 " squares. For the dark blocks, sew a 2 1/2 " dark square to either side of a 2 1/2" neutral/light square. 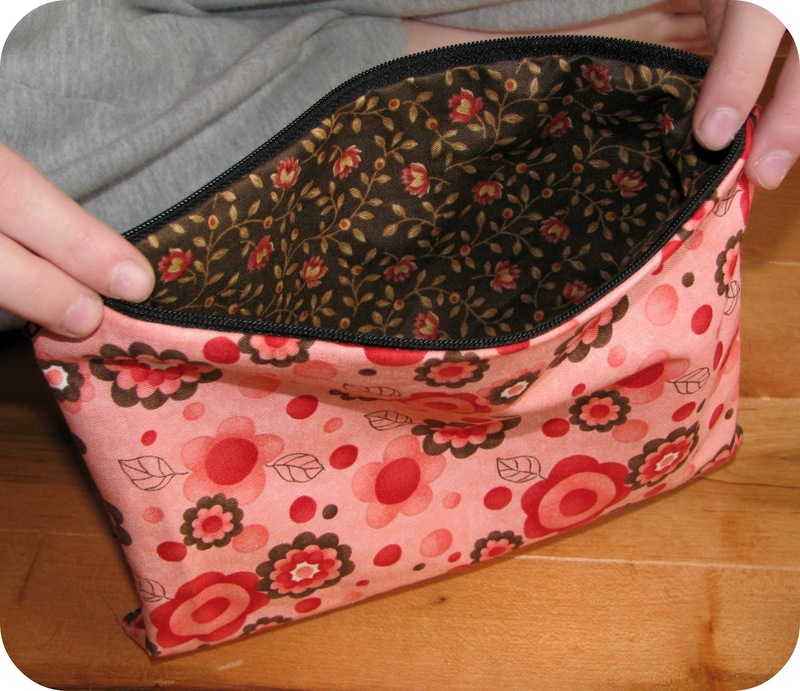 Then sew one 6 1/2" dark rectangle to the top and to the bottom to form a square. For the light/neutral blocks, do the opposite! 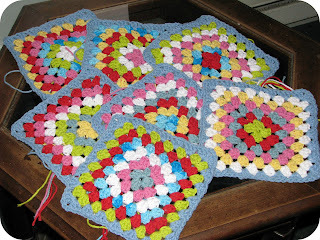 Arrange your blocks in rows, alternating the dark and light squares and then sew them up! That easy! You can speed up the whole process by chain-piecing the squares. My top finishes at approx. 48" x 60". On Sunday, I got working on Two Percent and everything went so well, I managed to quilt most of Block 2! I realized this week that I have way too many finished tops waiting for some quilting and I really need to bite the bullet and just get quilting. Besides, my quilting could use some practice! Last weekend, I felt lazy and really didn't want to drag Two Percent to my sewing table so instead, I got started with a new project. I had half a Jelly Roll just sitting on my sewing table (I used the other half for Kaleidoscope) so decided to start sewing simple blocks to make myself a cute girly lap quilt. I did some math and settled on small square-in-a-square blocks - each block can be completed with just 1/2 strip. I added a cream neutral and before I knew it, I had a bunch of squares! After arranging everything on the floor, I had 2 blocks leftover. I'm probably going to use one as the label for the quilt and add the other one to the backing. I'm hoping to finish this top on the weekend and I will definitely work on Two Percent.